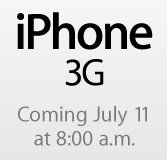 Despite some mixed signals at their retail meeting last night, Apple has now updated their retail website at http://www.apple.com/retail, indicating that the iPhone 3G will be launched at 8 a.m. at Apple retail stores on July 11th. AT&T had previously announced an 8 a.m. launch time for the iPhone 3G launch, but we had not had official word from Apple. 8 a.m. is earlier than either of the retail shops typically open. - Valid ID required. Social Security Number for those who are new to AT&T. - It remains unclear how existing non-iPhone AT&T will be processed. - Business customers must go to an AT&T store. - FamilyTalk plan buyers must purchase at least 2 iPhones, or have an existing iPhone to be used in the plan. - More details expected throughout the week.